Monday has become my favorite day of the week. My husband will tell you it’s because he’s gone back to work leaving me to my quiet house and accompanying quiet life, but I’d say it has more to do with looking forward to all that a new week brings. For us, this particular week marks the last of a grueling busy season which begins in earnest after the first of the year, slowly building in intensity with extended hours of work each day. At first, the hours are added on the end of weekdays, then begrudgingly, the alarm is set earlier in the morning as well. Saturdays at the office quickly follow, and a card table surfaces on Sundays in our family room where production is set up for a good six hours or more with any number of sports playing on the muted TV. This year, our SDSU Aztecs’ winning season and March Madness provided a pleasant diversion until their crushing loss to UCONN. But there’s always next year, isn’t there? This past week, the days have been more than 12 hours long. Saturday was a full day, and Sunday, the card table was left folded against a wall in the living room for another full day spent at the office. Dinner is usually not complicated because we eat late. I wait for him so we can have a bit of time together, maybe watch a recorded show. 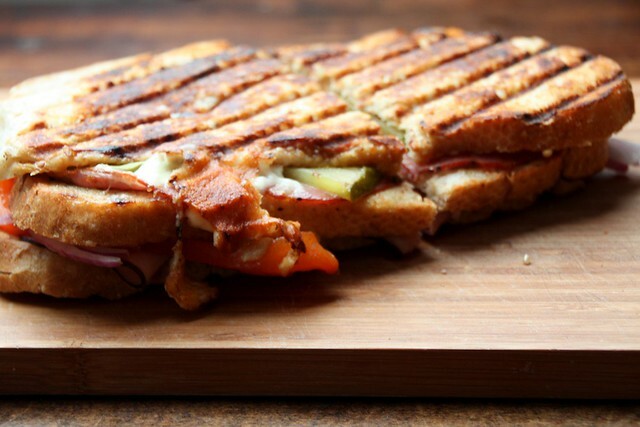 A good grilled sandwich is perfect for a Sunday evening after an 85-hour work week. The sweet potato fries I was going to make to enjoy with our panini will just have to wait for an evening later this week. 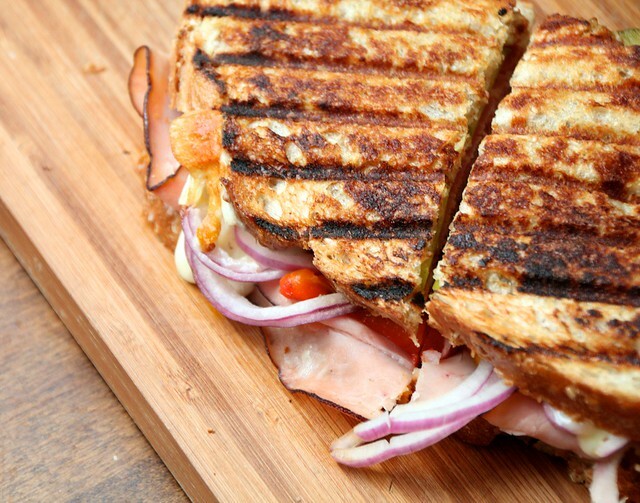 Do you have a panini pan? Make them double decker style by grilling the center pieces of bread first. Rub each lightly with olive oil on both sides. Place in a skillet, flipping when golden brown. After each side is done, set aside. 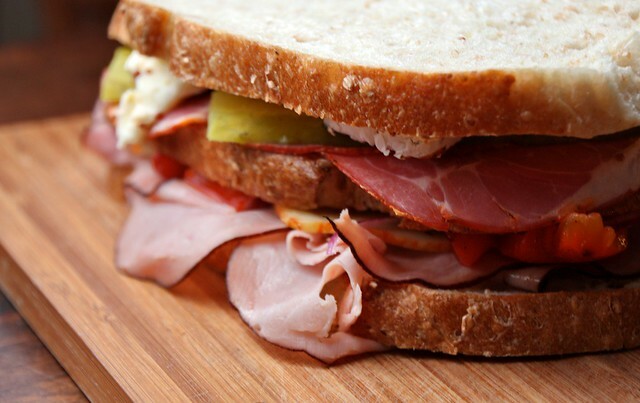 Prepare two more pieces of bread for each of two sandwiches by choosing your condiments. I chose two different types of mustard — one for each slice. My husband likes good old yellow mustard for his. 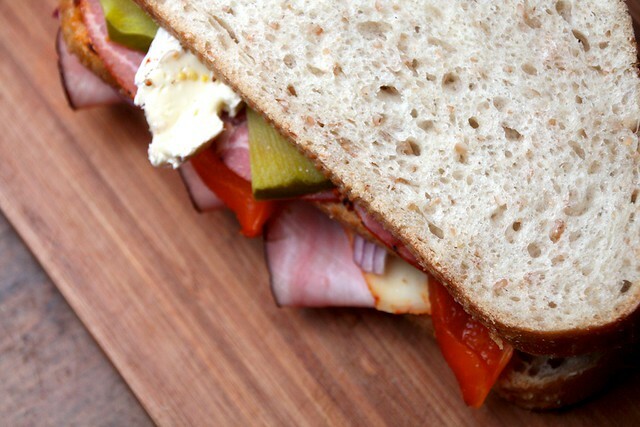 Provolone goes on over one slice, then some ham, some roasted red pepper, and red onion slices. Top with the pre-grilled slice of bread. Second deck begins with more meat — I chose the hot capocolla. Top that with a few nice slices of dill pickle, then top with brie and cap it off with the honey mustard piece of sourdough. Make sure the panini pan heats up with the lid in the pan and spray both with oil first. Drizzle a bit of olive oil over the exterior of both sides of the sandwich. Place in the pan, put the lid over, and press lightly for 10-15 seconds. Allow to cook until nicely browned on the bottom, about 2-3 minutes. Slice in half and dig in. If you don’t have a panini pan, then you could use two cast iron skillets of different sizes, heating both and using the bottom of one as a press. If you don’t have two skillets, then an oven proof dish that you can set something heavy over to help the panini settle could work. Have fun experimenting! As for flavors, have fun with that, too. 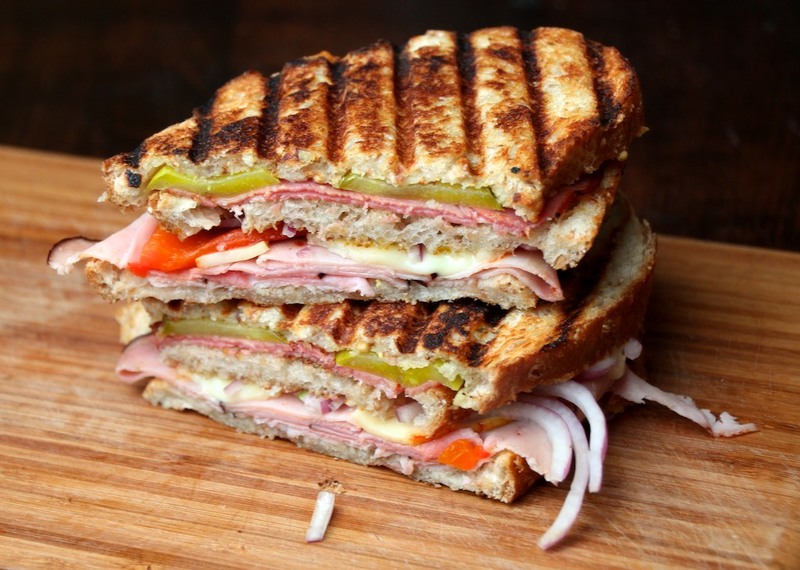 We like good old fashioned Cubano sandwiches and so this panino is my take on that. 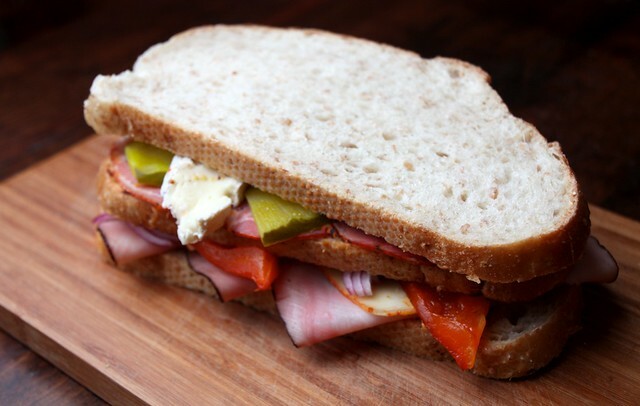 Clearly, there’s not much to prepare ahead with a sandwich like this, but if you take the time to do anything, then roast your own pepper. They’re so delicious, and not soggy like the ones purchased in jars. Yes, I do have them on hand, but it takes no effort to roast your own for something like this.